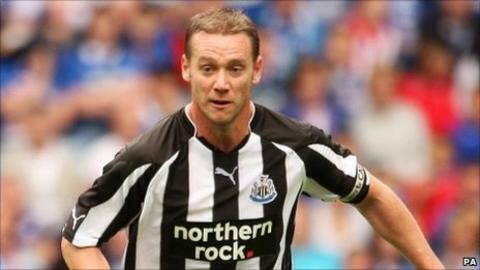 Newcastle United captain Kevin Nolan has completed his move to West Ham after signing a five-year contract. The 28-year-old, who played under Hammers manager Sam Allardyce at Bolton, has joined the Championship side for an undisclosed fee. "Having the chance to link up with Sam again is a massive thing," said Nolan on the West Ham website. "West Ham have shown a certain hunger and desire to make sure that I became their player." Talks had broken down between Nolan and Newcastle over the length of a new contract. "I am aware that the club made Kevin a good offer to stay, but could not agree over the contract," Magpies manager Alan Pardew told the Shields Gazette. "I would like to thank Kevin for his sterling efforts as a player and captain of this club, especially since I took over last season. "He displayed admirable leadership qualities, and I wish him every success at West Ham. It's a great club and I'm sure he will thrive there." Nolan, who is expected to take the captain's armband at Upton Park, pledged to pay back the faith West Ham had shown in him by giving him a long deal. "The be all and end all was that this club wanted me and the owners put faith in me and have given me a security of contract," added Nolan. "Now it's my time to repay them and hopefully I will do that. "I'm very sad to leave Newcastle but I'm coming to another massive club in my eyes, and hopefully I can be as successful as I was there [at Newcastle]. "I've come to West Ham because of the tradition of the club and everything about it. I've always enjoyed playing at Upton Park." Nolan is currently recovering from surgery on an ankle injury but is expected to be fit for the start of pre-season training. He scored 12 goals in the Premier League last season and 18 during the 2009-10 campaign as Newcastle won promotion back to the top flight. Nolan joined Newcastle for a fee of £4m in January 2009 from Bolton, for whom he made almost 300 appearances after joining as a schoolboy. It is thought that the Hammers, who were relegated from the Premier League, made an initial offer of £1.5m for Nolan but that the eventual fee could rise to as high as £4m. The former England Under-21 international, who was the Football League player of the year in 2010, had a close relationship with Allardyce at Bolton. Allardyce was appointed at the start of the month and made his first signing on Tuesday with the capture of defender Abdoulaye Faye on a free transfer from Stoke.